Volunteering - The Campus of the Jewish Home of Greater Harrisburg, Inc. Volunteers at the Jewish Home and the Residence are a valuable resource for the residents and to the professional staff. 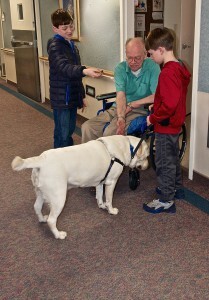 Compassionate, kind and loving volunteers make an enormous difference in the day-to-day lives of our residents. Their one-on-one visits, their one-on-one attention, give our residents great joy and make their lives more pleasant and much happier. What you give, you get back a hundred-fold. You give our residents great days; you receive wonderful days! 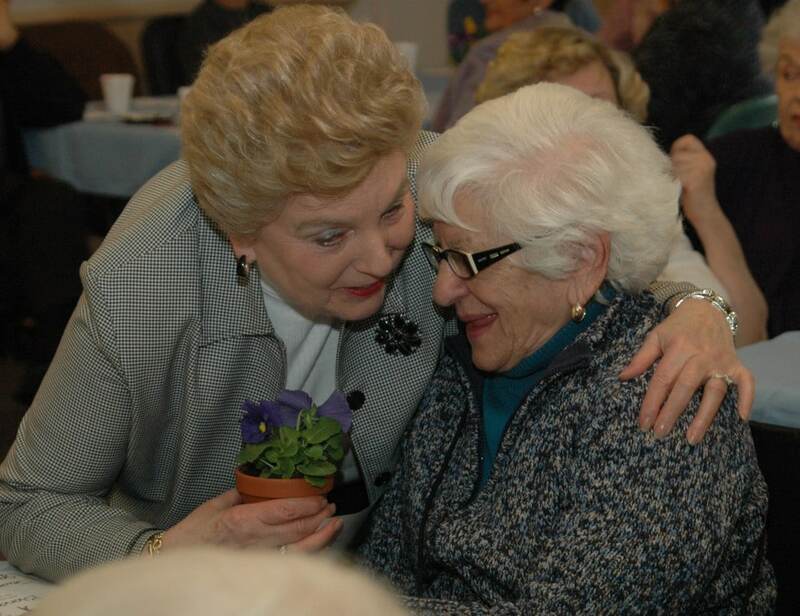 The exceptional people who volunteer at the Jewish Home and at the Residence come in all ages, all colors, all faiths, and they speak many different languages. But they have one thing in common: they care. Volunteers assist at Bingo, participate in special events, read and play games with residents, push wheelchairs to and from activities or perhaps, in fair weather, just sit outside and chat. Many volunteers report, as volunteers at the Home, that they receive enormous pleasure from volunteering. Some talk about leaving after their volunteer assignment happier than they were when the assignment began. A few volunteers are themselves disabled or even quite elderly, but that hardly stops them. All claim they get back far more than they give. The Jewish Home is fortunate to boast a strong Youth Volunteer program that, during summers and school breaks, helps enhance the lives of our residents. Our Youth Volunteers program doubled in just one year’s time. Youth volunteers serve in a number of capacities including assisting our activities staff, reading to and playing games with residents, and helping to transport residents to meals, activities and religious services. Some even work as receptionists. 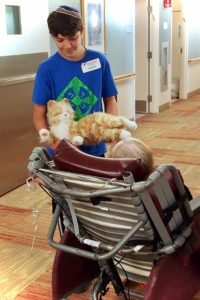 Recently, our Youth Volunteers swept patios, filled bird feeders, carrie around the Campus’ popular robotic cats and dog, and interviewed resident to learn about their lies before they came to live on Campus. The Director of Therapeutic Recreation and Volunteers at the Campus and the Assistant Program Director at the Residence will be delighted to explain volunteering on the Campus and will offer you a special volunteer tour experience.